Most books on modern design & architecture give the impression that design movements like De Stijl just sprang up on their own, making a clean break from the past with something totally novel. This is patent rubbish, as any designer knows. It is not possible to not be influenced by the past. As a designer you grow up with your favourite designers & designs, or you re-act against designs you don't like. This page is just a brief look at some of the design sources used by De Stijl. Many people ask us how we can do such a wide range of different styles, ie Arts & Crafts, Mackintosh, De Stijl, Van Gogh bedroom, etc.. But that is to fail to recognise the links between them all. 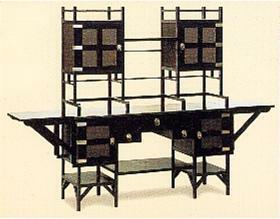 Some of the Arts & Crafts & Mackintosh work influenced Rietveld & others. Rietveld built the Van Gogh Museum in Holland. It goes on. De Stijl furniture aspired to mass production, but never got there. Rietveld especially was keen on mass producing some of his designs, to take the drudgery out of cabinet making (which he knew only too well as a trained cabinet maker). It was a style that influenced later designers reaching out to a mass market. It was always a niche market in it's own time, much like English Arts & Crafts. De Stijl furniture looks craft based, what lifts it above this is the design sensibility that would define modern furniture & interior style. The 3 photos above show the progression of Rietveld's Red Blue chair clearer than any number of words ever can. 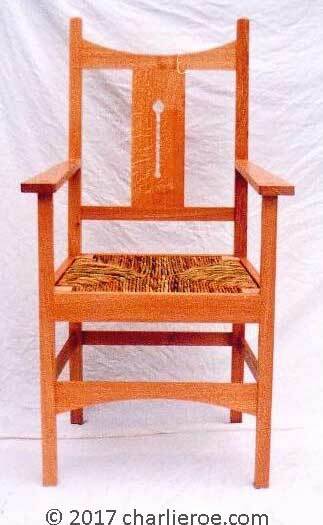 The chair on the left was designed by the Arts & Crafts Movement architect CFA Voysey sometime around 1900-1910. You can clearly see the de-contructed look has started. 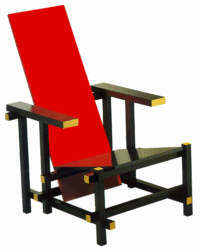 Rietveld's Red Blue chair first appeared, in wood finish, c.1918. 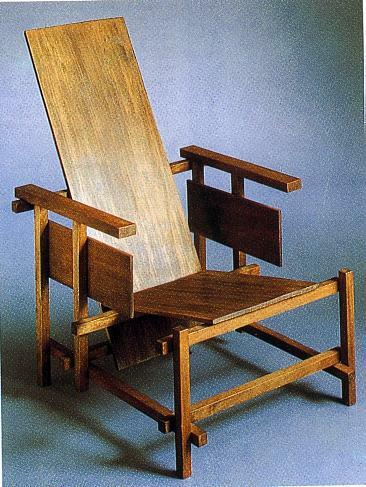 So Rietveld was a student when Voysey's chair was produced. Voysey had much of his work photographed & published, both in the UK & Europe. So Rietveld must have seen this as a student. The idea stayed in his mind & evolved into the classic chair we know today, with the influence of Mondrian for the colours. This is a dresser by the British designer EW Godwin, from the Aesthetic Style c. 1870. This piece was so ahead of it's time & different from anything seen for another 30 years. It almost out does Rietvelds' designs in it's stripped down aesthetic. Rietveld would have been aware of this & it must have made an impression on him. 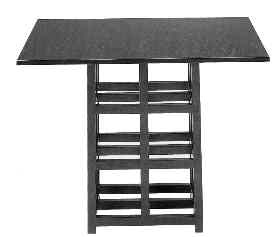 CR Mackintosh designed this black table. Mackintosh was an obvious source for Rietveld to draw on for inspiration, his work was widely published in the years Rietveld was a student. There was a wide vocabulary used by Mackintosh, & the others, to offer a total look in their design style. Rietveld followed the same path later. The chair above left is another example; a Theo Van Doesburg chair. Very simple in design & construction, enlivened with the use of colour. It has the same side panels above the seat as the chair above. The chair on the right is an English Arts & Crafts chair we made, style c. 1900-05. 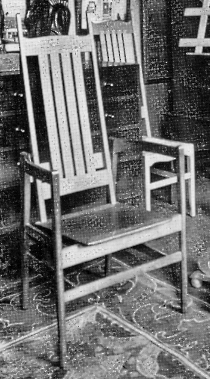 The influence on van Doesburg chair is obvious; at this time English Arts & Crafts style had been widely published & was very influential in Europe & USA. 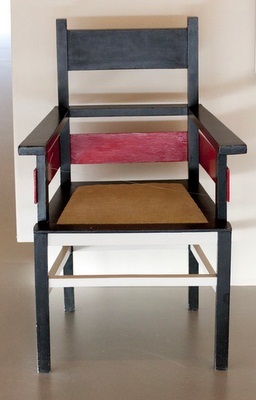 Van Doesburg took a chair design he liked & simplified & 'De-Stijled' it.